Howard Leight AirSoft Reusable Ear Plugs (NRR 27)5JulieAugust 8, 2017I use these earplugs for sleeping. They are soft and comfortable and long lasting. They block just enough noise to help me sleep but I can still hear the alarm and anything important that I need to hear. Howard Leight AirSoft Reusable Ear Plugs (NRR 27)4Carolyn burkhartMay 1, 2016These are the best! I use them to sleep. The sporting goods store where I usually buy them stopped carrying them so I was glad to find them on line. 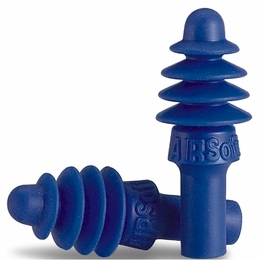 Howard Leight AirSoft Reusable Ear Plugs (NRR 27)5Dave AmlinNovember 6, 2015Great product. Comfortable and easy to use. Howard Leight AirSoft Reusable Ear Plugs (NRR 27)4steveSeptember 28, 2014I have purchased ~5 different earplug designs and have used them for blocking ambient everyday sounds. I found these were among the best for blocking sound. They are very tight sealing for me, which has caused some pain and irritation after long and or repeated use and occasionally slow, difficult and painful to remove. I think the non-corded design is good because there is no noise from the cord, and the cord can't catch on anything and you get you eardrum yanked out with the earplug by accident because of the good seal! Howard Leight AirSoft Reusable Ear Plugs (NRR 27)2Glen T.September 16, 2014I bought these for motorcycle riding because I saw that the noise reduction was a couple points better than the Smartfit. Might be the case, but these were very uncomfortable and I only wore them for a short ride before grabbing the Smartfit. Howard Leight AirSoft Reusable Ear Plugs (NRR 27)4Charles YaoNovember 29, 2013My ears hurt on first use, for half an hour of swimming. It still hurts but not as much. It fits very tight, very well - no water is coming into my ears. I usually swim for half an hour each day. Howard Leight AirSoft Reusable Ear Plugs (NRR 27)5Nilsa GAugust 5, 2013The plugs work perfect, they are a great size to my ears. I like the color and the shape. They block lots of the sound, it helps me take care of my ear and reassures that I will be able to hear at age 70. Howard Leight AirSoft Reusable Ear Plugs (NRR 27)2JuneJanuary 20, 2013I ordered three different types of ear plugs to try to silence my husband's very loud snoring. The Howard Leight Airsoft ear plugs were my least favorite because they were uncomfortable to sleep with and they didn't work as well as the ear push-in ear plugs. Howard Leight AirSoft Reusable Ear Plugs (NRR 27)5tarawa1943November 29, 2012They work well on outside ranges, with .22 lr, with big bore stuff they need use with muffs to block percussion, it is hard to hear the range commands with muff+NR27's. Howard Leight AirSoft Reusable Ear Plugs (NRR 27)5FionaJune 25, 2012Totally excellent. Discovered them in New York in 1990 & been using them ever since. I live in Belgium, & you just can't find them. So Web site, choice, price, payment, delivery; just PERFECT.Thankyou. Howard Leight AirSoft Reusable Ear Plugs (NRR 27)5tarawa1943May 18, 2012use on the range and in the pool, fit right and work great! Howard Leight AirSoft Reusable Ear Plugs (NRR 27)4tarawa1943April 17, 2012They fits my ears and working with peltor shooting muffs are good to go with big bore shooting. They stop all the HP noise.